* The servo position was not saved in configure mode when a + or – command was the last command before saving. * Added a generic option to detach a servo or not. * Added the I-command for Accessories. This inverts the output. E.g. a led is turned off instead of turned on and vice versa. * Added better support for MEGA2560. * The default rotation speed is now part of the generic I-command. * Some minor display enhancements. MARDEC is a program(aka a sketch) for the Arduino microcomputer. It uses the DCC-signal from the DCC-central to control all kinds of accessories on your model railway. MARDEC runs in two different modes. A configure mode and a run time mode. In configure mode you specify for each pin of the Arduino the DCC address and the required action to perform. The Arduino is connected via USB to your computer. With only your keyboard and monitor you can easily, with a simple question and answer ‘game’, specify all the functions that you want to perform with MARDEC. Therefore MARDEC uses one-character commands. See the manual for examples. It communicates with you by using a terminal emulator program called Putty. In run time mode MARDEC ‘listens’ to the DCC signals on your track. If an address passes by that you have configured for one of the Arduino pins, MARDEC will execute the action that was configured for it in configure mode. The control of accessories in 10 different ways, including activating turnout coils and variable PWM control. An Arduino pin can also be configured as an input. By triggering an input three other (output) pins can be activated. Two of them with a time delay. Interactive, so via monitor and keyboard, configure the servos and accessories. That is completely independent of the used DCC Central. The Arduino software is not necessary. Of each servo the start and end angle can be set accurately on the degree. A random DCC address (1-2048) can be assigned to each servo and accessory. Each servo (max. 8) can be coupled with a relay for frog point polarization. When rotating the servo, halfway through the twisting, this relay will be converted. A test option. All the servos will rotate twice. The accessories are also activated. Capture of ‘ inversion ‘. With this option you can set whether a turnout is set to straight or rounded when the servo rotates to either angle. This is required because the servo can be mounted in several ways. A documentation option to show all settings. A reset option to clear all settings from the MARDEC memory. Adjustable default speed of the servo (5-50 ms. per degree). But each servo can be set separately. Return to configuration mode by connecting the USB cable, start configuration program and press ‘C’. Single steady. Sets an output pin permanent high or low. Double steady. Same as single steady, however a second pin has the inverted value. Single flashing. A pin switches continuously between high and low. The high and low times can be set separately. Double flashing. Same as single double, however a second pin has the inverted value. Single one shot. An output pin is activated for a short, configurable, time on the low to high transition of the DCC signal. 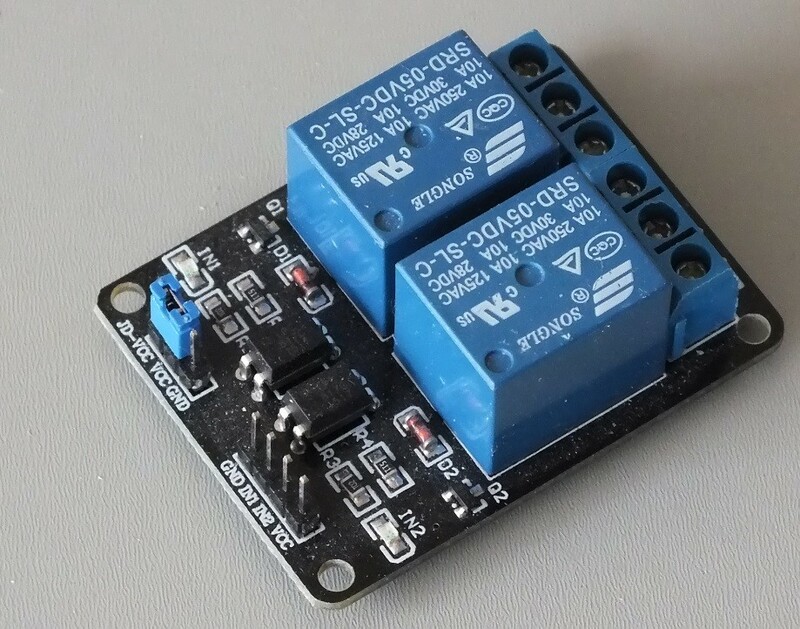 Analoge (PWM=Pulse Width Modulation) An output pin is set from a configurable minimum value to a configurable maximum value in a configurable time on the low to high transition of the DCC signal and from the maximum value to the minimum value on the high to low transition of the DCC signal. Flicker mode. A connected led can flicker to simulate fire or welding. Disco lights. A connected led goes continuously on and off. The on/off times are randomly chosen between two configurable values (2-500 millisec.) . Same as Random on/off but 1000 times faster. A log option saves all configure and run time actions on disk. Independant of used bus structure (LocoNet, S88 etc). But the input for Mardec is always DCC. 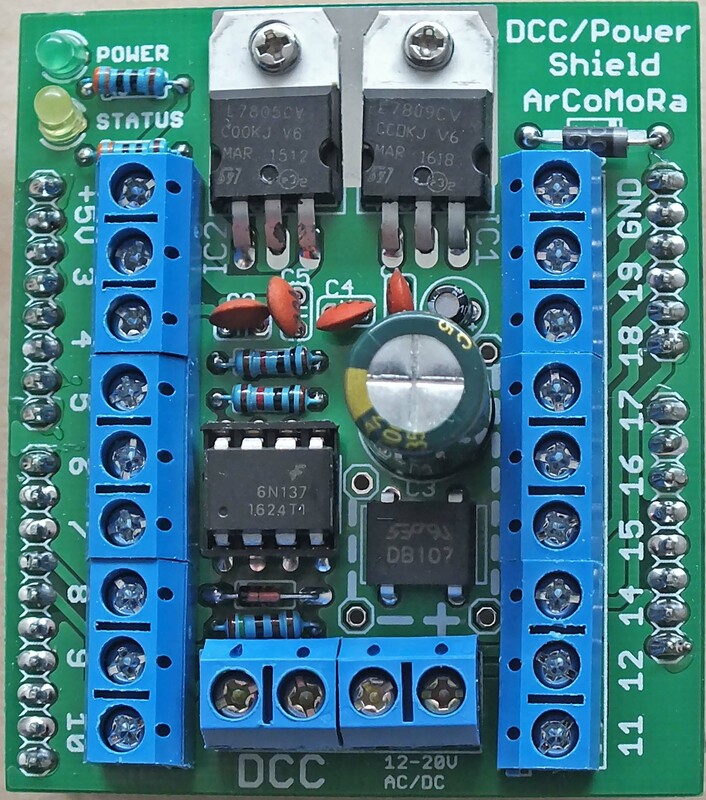 This shield contains the DCC-circuit and also a 9 Volt power supply for the Arduino and an additional 5 Volt for e.g. leds, relays or servo’s. However it is strongly advised that you use an external 5 Volt power supply for multiple relays and servo’s. You can connect them directly to your Arduino. 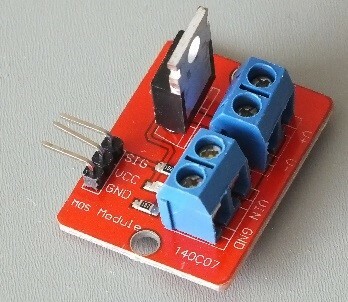 They are also available with 4 and 8 relays on a single print. This is absolutely Genius, the Mardec is so easy to operate, even for electronic illiterates like me. Works like a charm. I definitely going to use the software and the shields to operate all servos on my layout. Looks like the perfect solution for me !!!!! Question : can you link more DCC/Power boards so I can operate about 60 servo’s ??? I will start with two UNO’s then. can you help me with the source code in a .ino file? After installation of the software the .ino file can be found in My Documents/Arcomora. Great job on this software. Is it also possible to control motors, using a dual h bridge? No. Mardec is not designed for controlling motors. But you can use an Arduino of course. I am still a newbie on Arduino and the Mardec but I already got it working with an Uno. Fantastic. Thanks for the software, it is very easy to use. Now I also have a Nano that I would like to test. I added a “new Arduino” on a different Com port and it was well detected. I tried loading and configuring Mardec on the Nano but it fails. 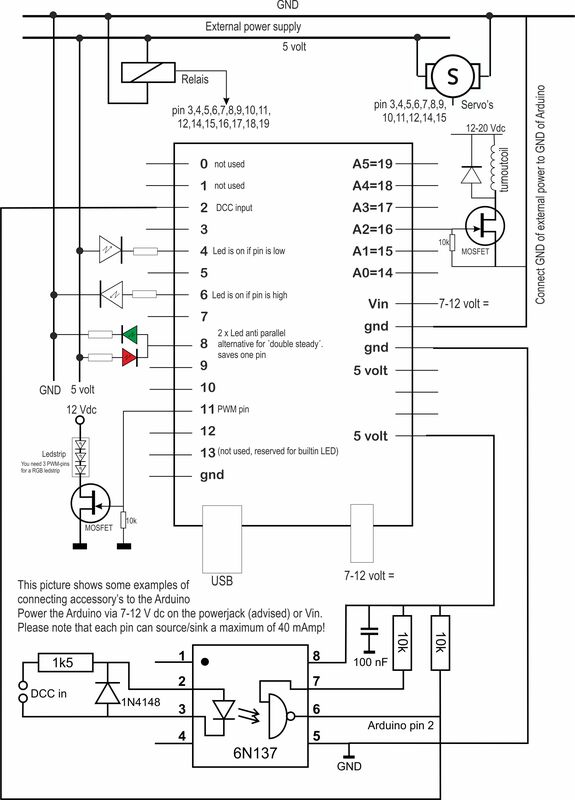 It says on avrdude that arduino is “not in sync”. Probably I need to select to upload to Nano instead of Uno, but how? Can you help me? I know that the Nano is workling properly because I can upload sketches to it using IDE. I know this will work with servos but will it also work with Tortoise type stall motors, please? After a short look at stall motors I don’t think they can be controlled by an Arduino in the same way as servo’s. Thanks for making this project available. I’ve built one of the DCC shields I ordered and I was wondering if you could steer me in the right direction on an issue I’m having? I’ve set up an Arduino UNO as my base station and use JMRI as my control programme. I’ve set up some relays (to control layout lighting) and a flickering led (welding simulation) via Mardec and it works fine through JMRI. I also set up a couple of servos (address 200 and 201) that test fine using Mardec but won’t work with JMRI or the base station command window. I believe it’s an issue with addressing and nothing at all to do with Mardec. I have tried several addressing combinations including sub-addresses, but to no avail. Any idea what addresses I should use to get this working. Please excuse my ignorance as I’ve only just started looking at DCC and JMRI and again, this issue is to with my ignorance and not your project. This is really cool, also thanks for providing the code. I think my Breadboard for DDC signal with Optocoupler is working as I ran the DCC monitor and send commands from DCC++ and I was seeing the value DCC monitor. Je viens de tester “MARDEC” sur un ARDUINO UNO et celà fonctionne du premier coup. Bravo, c’est super à utiliser. – est ce que l’utilisation de l’EEPROM n’est pas limité en nombre d’écritures? – pour l’installation dans un NANO, j’ai bien trouvé UploadNano.cmd, mais je ne vois pas comment l’utiliser. Si je clique dessus, rien ne se passe. Un petit commentaire: dans votre documentation, vous parler de “point de grenouille”, je pense que la traduction française exacte est : “pointe de coeur” pour un aiguillage. I will fix the French document. Yes the EEPROM has a limited number of writes. But that is very big. But Mardec uses EEPROm.Update commands instead. Use the Upload tool in the Start menu. But the Nano requires first a new boorloader. I just tested “MARDEC”, and it works the first time. Very good job. It’s very friendly to use. – I suppose, you are using EEPROM to keep the position of the servo. Is there a maximum times of writing in EEPROM? – I wish to load the software in an ARDUINO NANO. I have found the “UploadNano.cmd”, but when I click on this file, nothing happens. What is the good handling? Just a little thing in the French translation: you talk about “point de grenouille”, the best traduction in French is “pointe de coeur”. I have build several DCC / Power boards now and all are tested via a laptop computer and I must say that they work like a charm (with the computer connected). But now comes the problem, when I connect the Arduino (with the DCC / Power Board) to the DCC of my train layout instead of the computer, the servo will not react. I have a Z21 (the black box with white router) but I do not understand how to go further so that the two systems communicate. Maybe a clear instruction sheet could be added to your MARDEC manual. I know it should work, but i am not such a bright light in this matter. Can you please help me out ( or somebody else perhaps who has already his turnouts operated by servo’s and MARDEC). Did you switch to normal mode? Did you configure the address offset for the z21?